NOAA has released their 2018 Atlantic hurricane season predictions. U.S. government forecasters are predicting a near or above-normal 2018 Atlantic hurricane season, likely with 10 to 16 named storms and up to four of them being major hurricanes. National Oceanic and Atmospheric Administration forecasters released their storm season outlook Thursday at the agency's aircraft operations center in Lakeland, Florida. That facility is the base for NOAA's "hurricane hunter" aircraft that fly into storms to collect data used in storm forecasts. Forecasters are predicting five to nine hurricanes with wind speeds of at least 74 mph. Major hurricanes have wind speeds of at least 111 mph. An average hurricane season produces 12 named storms, of which six become hurricanes, including three major hurricanes. "The possibility of a weak El Nino developing, along with near-average sea-surface temperatures across the tropical Atlantic Ocean and Caribbean Sea, are two of the factors driving this outlook," NOAA said on its website. The six-month Atlantic hurricane season extends from June 1 to Nov. 30. "There are no strong climate signals saying it's going to be extremely active, like last year, or extremely weak," said Gerry Bell, the lead hurricane forecaster at NOAA's Climate Prediction Center. Meanwhile, NOAA also revealed its prediction of a near- or above-normal season for the eastern and central Pacific regions. The eastern region could see 14 to 20 named storms, with seven to 12 of those storms expected to be hurricanes. 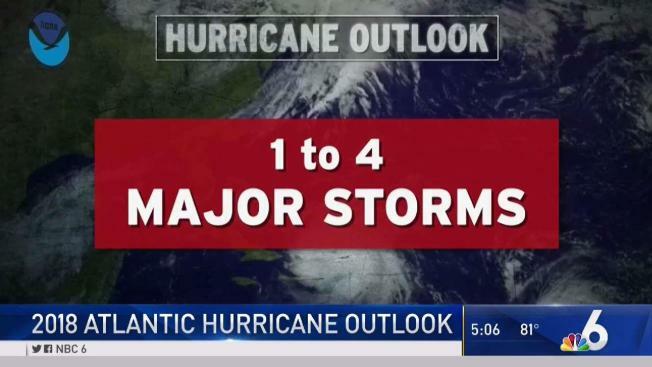 Up to seven could become major hurricanes. The central region could see three to six tropical cyclones, which includes tropical depressions, tropical storms and hurricanes.